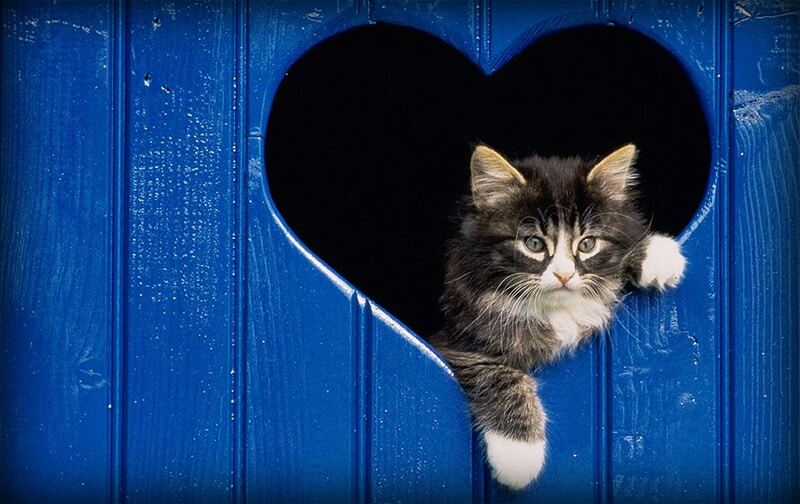 Heartworms in cats are often not detected early because symptoms appear very subtly at the beginning of an infection. For this reason, preventative measures are the most effective way to protect your cat’s health, not to mention that it is much cheaper than treatment once infected. Heartworms (Dirofilaria immitis) are parasites which infect the heart or adjacent large blood vessels. The worms can grow from 6 to 14 inches long and are about 1/8 inch wide. Multiple worms can infect an animal at once. The effect of heartworm disease on an infected animal depends on how many worms are in the body, how long they remain there and how quickly they are treated. It is generally believed that heartworms are far more common in dogs, however recent studies of cats with respiratory and heart diseases have discovered that rates of heartworm disease are much greater than previously anticipated. Having said that, unprotected dogs are about ten times more likely than unprotected cats to contract heartworm disease. Moreover, the worms that infect cats are smaller, live shorter lifespans, and don’t tend to number more than a few. Because of these shorter lifespans, it is more common to see spontaneous recovery from heartworms without treatment in cats. Heartworm disease is contracted through mosquitoes. The worms depend on mosquitoes and cats as hosts to exist. As many as 30 different species of mosquitoes can act as a host for heartworms and transmit them to animals which they bite. Mosquitoes transmit heartworms by feeding on an infected cat or dog, thereby ingesting heartworm larvae. The larvae develop and move through the mosquito’s digestive tract, from their gut and into their mouth. When a mosquito bites a cat, it then injects the larvae, which infect their new host’s body. As they mature, the larvae migrate from the bite and towards the heart and associated blood vessels, eventually becoming adult heartworms capable of reproducing. Heartworms cannot be passed from cat to cat, only via infected mosquitoes. 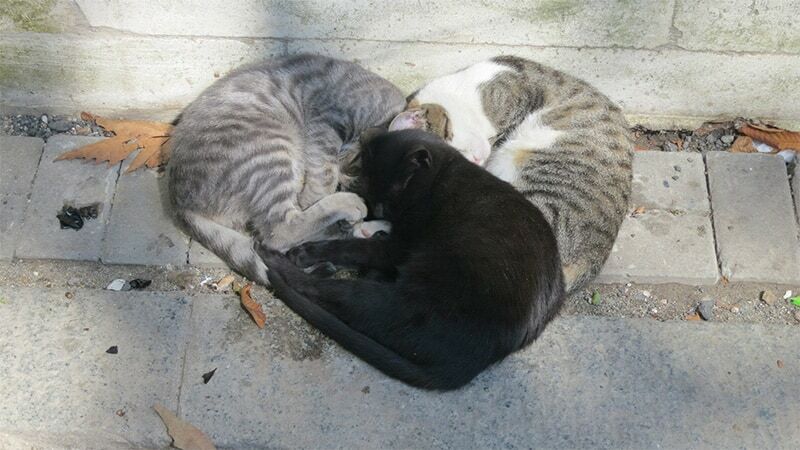 Due to this method of infection, outdoor cats are much more likely to be bitten by mosquitoes and therefore infected with heartworms. The symptoms of heartworm disease are generally indicated by difficulty of breathing. Cats coughing, struggling to take breath or breathing in a laboured manner may be suffering from heartworms. Additionally, vomiting could also indicate an infection. Unfortunately, there is no single, 100% reliable test for heartworms. Therefore, diagnosis depends on a combination of different tests including up to four different blood tests. An antibody test examines whether the cat’s body has produced antibodies in response to a heartworm infection. The antigen test searches for evidence of female heartworms. A blood sample can show the presence of microfilariae (heartworm larvae). Finally, an eosinophil count will show whether there is an elevation certain white blood cells present which would indicate a parasite infection. Radiographs/x-rays show the size of the heart and pulmonary arteries. Cats which are suffering from an infestation often have an increased pulmonary artery or exhibit blockages in their arteries between the heart and the lungs due to infestations. Cardiac ultrasounds and echocardiography allow the veterinarian to view the internal structure of the heart and surrounding vessels. This test might allow the examiner to see the presence of adult heartworms, although, since there are usually very few and are quite small in cats, it is not always a very effective test. Preventing heartworms is much easier, safer and more effective than trying to treat them once they are present in a cat. There are several reasons why taking preventative measures against heartworms is preferable to treating an existing infection. As mentioned previously, it is very difficult to diagnose heartworms as there is no single test which can definitively prove an infestation. Moreover, there is new evidence coming to light that suggests cats are much more likely to become infected with heartworms than previously believed. Although dogs are still at greater risk, cats are now considered to also be at considerable risk of contracting heartworms. The most important argument for preventative treatments is that there is no treatment for heartworm infestation in cats. Treatments that do exist are far from perfect; at best they are ineffective and at worst they can cause illness and death in the cats which are treated. The best treatments that exist take around two years to eliminate the heartworms, and at any stage during this period there could be complications resulting in further illness or death. By contrast, prevention is safe, easy and effective. Kittens can be treated from the age of six weeks and cats who have been treated have not shown signs of bad reactions to the drugs. Veterinarians recommend that all cats living in areas with mosquitos received all-year-round monthly heartworm preventative treatments. If mosquitoes are seasonal, then the cat should receive preventative treatments monthly for at least 6 months of the year. 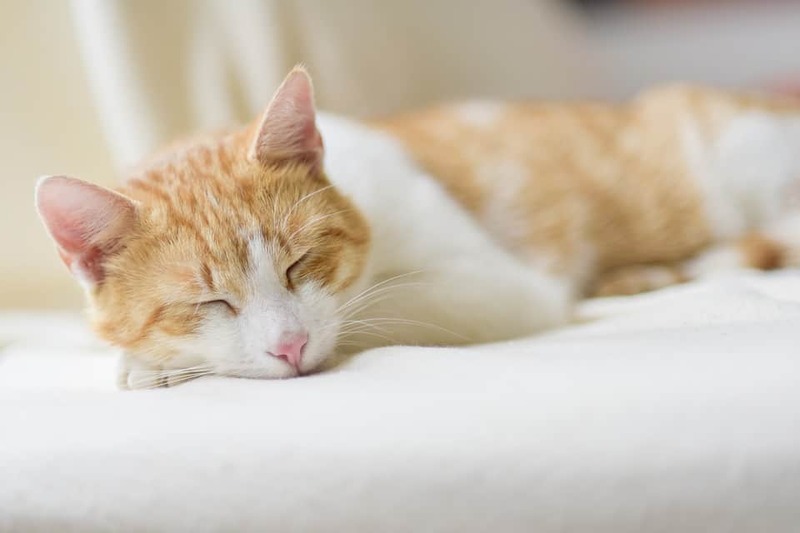 Although outdoor cats are at greater risk of contracting heartworms, indoor cats should still be given preventative treatments. Heartworms are transmitted from animal to animal via mosquitoes, which inject the cat with heartworm larvae when they bite. These larvae mature inside the cat, gradually developing into adult heartworms which can grow up to 14 inches long. Mosquitoes can easily get inside a house, and therefore it’s essential to also give indoor cats preventative treatments as well. Before administering any heartworm prevention medication, consult with your veterinarian. 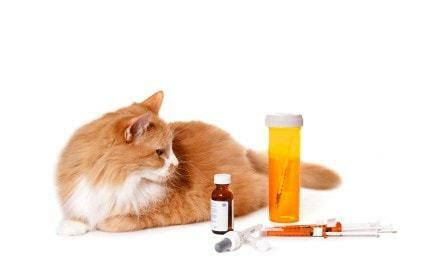 They can advise you on the correct dosage for your cat, depending on their age, weight, health and any other medications they may be taking. Additionally, they will only give you preventative treatments if your cat does not have heartworms. The advantage of oral heartworm prevention medication is that it has existed for the longest period of time, therefore it is a tried and tested method. There are rarely side effects if administered correctly, but a few cats experience vomiting, diarrhoea, or loss of coordination. Topical preventative medications are newer and have added benefits, such as the additional prevention against fleas, mites, ticks and other parasites. This means that you could protect your cat against multiple parasites, internally and externally, with just one monthly application. The best place to apply these medications is between the shoulder blades, directly onto the skin. This area is almost impossible for cats to preen so they are unlikely to ingest the medication during their grooming. It’s important to keep other animals, especially other cats, away from the treated cat for at least 30 minutes after application. This prevents them ingesting the medication whilst grooming the cat. As mentioned above, there is no approved drug to treat heartworms in cats. The best option to treat infected cats is to give them medication for dogs. However, this can cause significant side effects. Moreover, even once the heartworms are dead, they must pass through the pulmonary arteries to the lungs, where they can cause complications including acute pulmonary failure and even death. The other option is to treat the symptoms of the heartworms and hope that they die of their own accord and the cat outlives them. Of course, the possibility that the cat could die suddenly still remains as long as the worms are alive. There are beginning to be surgeries to remove heartworms in cats, however, these techniques are still in their early stages and carry an element of risk for the present. Therefore, as you can see from this article, the best thing for your cat is to treat them with preventative medications to ensure they do not contract heartworms in the first place.